Learn about the temperament and personality of the Sussex Spaniel. Discover what he's like to live with, his traits and characteristics and how he generally behaves. And look at lots of Sussex Spaniel photos. 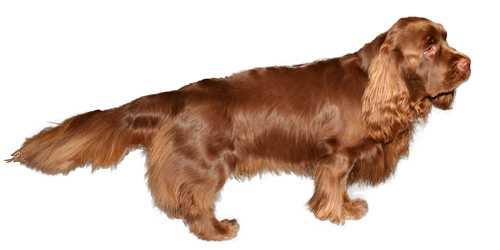 The Sussex Spaniel is friendly, cheerful and good-natured. He's calm and unrushed. He loves children and gets along well with them. He's friendly with other dogs. He's an athletic dog who loves the outdoors. He drools a lot. He has highly developed scenting abilities and can be easily distracted by interesting smells. So you need to keep him in a securely fenced area or on a leash most of the time or he might wander off after the scent. The Sussex Spaniel is harder to train than most other dog breeds. He learns new commands more slowly than the majority of other breeds. You will need to be extra patient when Training him. The Sussex Spaniel sheds a fair amount of hair. You'll find hair stuck to your couch, carpets, clothes and everything else in your home.